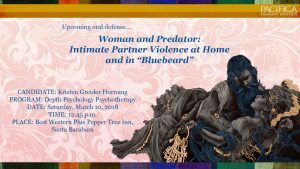 I am excited to share that I recently defended my dissertation research at Pacifica Graduate Institute for my PhD in Depth Psychology with an Emphasis in Depth Psychotherapy. You can view my defense here. Just skip forward a few minutes to avoid the part where I am waiting for my external reader to connect by phone. I have chosen to share my defense in hopes that it will provide educational value as a keystone of the research process.